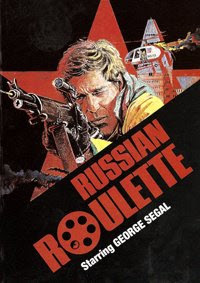 As the Quiller Memorandum is one of the best spy films ever made, I eagerly look forward to any spy film starring George Segal, and Russian Roulette isn’t a bad one, although it sometimes veers towards a police procedural style story rather than an out and out spy film. At the risk of being flippant, it could almost be described as being the Dirty Harry of spy films. As the film opens, the Russian Premier, Kosygin, is about to tour Vancouver in Canada. Security arrangements are being checked and double checked by both the KGB and the Canadian authorities (with a little help/interference from the CIA and Britain’s Special Branch). Tim Shaver (George Segal) is a Royal Canadian Mounted Police officer, and like all good cops from 70’s era films, he’s on suspension for striking a superior officer. To keep himself occupied, he is moonlighting for Commander Petapiece of Special Branch (Denholm Elliot). Shaver’s mission is to track down a Russian dissident, Rudolph Henke (Val Avery), and keep him out of harm’s way, while the Premier tours. It is believed that Henke will attempt to assassinate the Russian leader. Shaver wastes no time tracking down Henke and follows him back to his apartment block. After Henke is settled in his room, Shaver enters the building and quietly sneaks in Henke’s room with his gun drawn and raised. But Henke is gone. The only lead is a trail of blood which leads to a small window and then to the fire escape. Shaver naturally thinks it is suspicious and believes that someone is setting him up. Even though he is on suspension, he calls in a few favours from some work colleagues. The first is Bogna Kirchoff (Christina Raines) who also happens to be Shaver’s on again – off again girlfriend. Shaver’s other ally is Hardison (Gordon Jackson). Shaver sets his two bloodhounds to work finding out more information about Henke. Meanwhile a hired thug, Raymond ‘Rags’ Ragoulia (Richard Romanus) from Detroit has arranged for Shaver’s car to be towed away. Without a car, Shaver accepts a lift from ‘Rags’, who appears as a good Samaritan. As they travel, up ahead a van has broken down. ‘Rags’ slows the car to stop and help out, but Shaver realises that it is a trap and after pulling his gun, orders Ragoulia to drive on. The confused hoodlum is just a delivery boy who has been hired by the KGB to do their dirty work – although Ragoulia doesn’t know who his employers are, and passes on little useful information to Shaver. After his encounter with ‘Rags’, Shaver takes Bogna to dinner. Later events turn ugly when they return to Bogna’s apartment. They find Hardison dead in the bathroom. Russian Roulette’s story is presented in a complicated way, with the plot threads unravelling before our eyes. At the end, it all makes sense and doesn’t seem quite so complicated, but you are forced to pay attention as you ride along with the characters. The film moves towards an exciting and well staged finale as a motorcade carrying the Russian Premier winds it’s way through the streets of Vancouver. The film is buoyed considerably by the presence of George Segal. In recent years, appearing in shows such as Just Shoot Me, he has showed off his ability as a light comedian, but let’s not forget the guys was ‘Quiller’ and knows how to put in an earnest performance as a spy – and yes, the poor fellow get’s drugged once again by the enemy. Russian Roulette also has on a hand a fine collection of familiar supporting actors, such as Gordon Jackson, Denholm Elliot and Nigel Stock. Sure this is just a walk in the park for these guys, but it’s great to see familiar faces doing what they do best. All in all, Russian Roulette is a fine thriller. It doesn’t spoon-feed the audience and you’ll have to pay attention – it’s not the type of film where you can knock back a sizeable amount of your favourite tipple and expect to know what’s going on. The actions scenes are few and far between, but at no stage does the film seem boring, and like all good thrillers from the seventies, it has a touch of paranoia about it. It’s not in the same league as The Parallax View, but it does feel like Shaver is going it alone, with operatives closing in from both sides. Recommended.